Beloved sister of Amy Bertrand of Westland. Mabel graduated with a Master’s of Science degree at Wayne State in 1942 after attending night school and while teaching in Detroit. A gardener, birder, traveler, painter, jewelry maker, environmentalist, and quilter, Mabel enjoyed all of nature. A memorial service will be held Saturday, May 30, 2009, 10:30 a.m. at Trinity Episcopal Church, 26880 LaMuera, Farmington Hills. Memorial contributions may be made to Trinity Episcopal Church. Mabel’s legacy will be carried on through the conversion of her home on Harcourt to a senior assisted living residence. She grew up on a farm in Canton with her three sisters and two brothers. Her mother died when the youngest brother was born, leaving the oldest girl, Nell, to take care of the baby. Nell had to stay home from school until the next sister was old enough to take care of the other children. By the time it was Fake's turn to assume that responsibility, her father remarried so she was allowed to stay in school. After graduating from high school in Plymouth, Fake attended Michigan State Normal College, to get her teaching degree. Choosing a career wasn't hard for Miss Fake. "It was the only thing I could think of to do," said Miss Fake. "My mother was a teacher and my sister was a teacher." 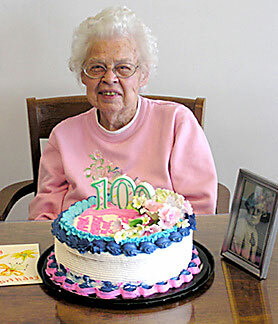 During her first week at Michigan State Normal College, Miss Fake almost lost the opportunity to see her next birthday, let alone her 100th. She came down with acute appendicitis and was in the hospital for two weeks. "Gangrene had set in," said Miss Fake. "I almost died." Miss Fake had to rest at home for the remainder of that term, but returned to Eastern the following year. 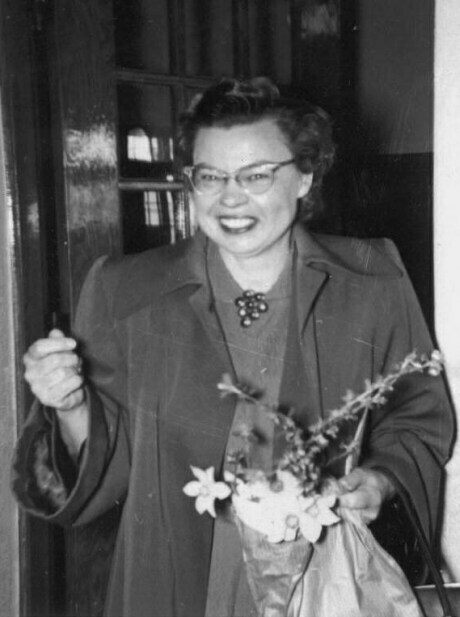 During her two years at Eastern, Miss Fake lived in a rooming house with five other girls. She shared a bedroom with one other girl, and all six of them shared the kitchen. There were no dormitories or dining commons. "I had to cook my own food," said Miss Fake. "I went home on the weekends to get enough food for the next week." After graduating in 1926, Miss Fake taught at a two-room school in Belleville. Miss Fake and the older students were in one room, while another teacher taught the younger students next door. Miss Fake eventually went from living and working in cramped quarters to stretching her legs on the open road. across country with a friend. They made it to California and back with only $150. "Gas was 8 gallons for a dollar and cabins were 50 cents apiece," said Miss Fake. degrees in art, this time from Wayne State University. until she retired in 1975.
on Norwegian freighters, staying in YWCAs along the way. "We had no reservations," said Miss Fake. "When we wanted to go, we just took off." Miss Fake started her trip sailing from California to Japan. From there, she traveled to China, Singapore, India, Egypt and Europe. "In Paris, we rented a Renault and vagabonded around Europe for a month," said Miss Fake. The two drove through Spain, Switzerland, Germany and the Netherlands before returning the car in Paris. "We got a flat tire near Grenada," said Fake. Their mechanic not only fixed their car, but also offered a bit of hospitality. "He invited us to the house for dinner and then showed us around the city." Three years ago, Miss Fake moved from her house in Farmington Hills to the Fox Run retirement community in Novi, where she keeps busy with her hobbies and events at Fox Run. "I love it here," said Miss Fake. "I've made so many friends." Miss Fake continues her interest in art, occupying her time with watercolor painting, quilting, ceramics and jewelry making. She is a member of the Trinity Stitchers, a group of members from her church who meet every Wednesday to crochet afghans for local hospitals or sweaters for children in Africa. Miss Fake celebrated her birthday in style, with two parties in addition to the one at EMU. Miss Fake received flowers and gifts from her friends and 237 birthday cards. "Fox Run threw me a party that you wouldn't believe. Everyone was there," said Miss Fake. Another party was hosted for her at Trinity Church, where she's been a member for more than 50 years. Miss Fake keeps herself healthy by eating right and exercising. She walks and occasionally uses the equipment in the retirement center. "I just got me a new walker, so I prefer to walk outside," said Miss Fake. Miss Fake says that the secret to her long life is good genes. 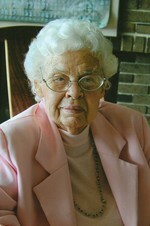 Her two older sisters lived to be 96 and 99. Her younger sister is 92 and lives in Westland. After 80 years traveling across the country and around the world, Eastern Michigan University graduate Mabel Fake recently returned to her alma mater to celebrate her 100th birthday. Her centennial was actually April 12, but Eastern hosted a small party for her in the Halle Library Archives May 11. Miss Fake ate birthday cake while looking at pictures and papers from her graduation year, 1926. Though much at EMU has changed between the time Miss Fake attended school (then Michigan State Normal College) and the present, one thing has stood out. "It's (campus) so big now," said Miss Fake. "It didn't seem small to me at the time, but it was tiny by comparison." Mabel Fake has come a long way to reach her milestone.